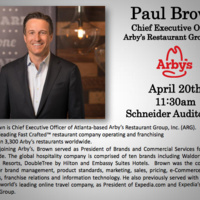 Paul Brown is Chief Executive Officer of Atlanta-based Arby’s Restaurant Group, Inc. (ARG). more than 3,300 Arby’s restaurants worldwide. Prior to joining Arby’s, Brown served as President of Brands and Commercial Services for Hilton Worldwide. The global hospitality company is comprised of ten brands including Waldorf Astoria Hotels & Resorts, DoubleTree by Hilton and Embassy Suites Hotels. Brown was the company's leader for brand management, product standards, marketing, sales, pricing, e-Commerce, loyalty programs, franchise relations and information technology. He also previously served with Expedia, Inc., the world’s leading online travel company, as President of Expedia.com and Expedia’s Partner Services Group.